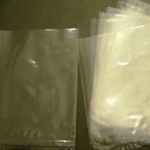 These general purpose waterproof polythene bags are suitable for storing or packaging a wide array of items. They can be sealed with a heat sealer or simply stapled or taped. © 2019 Indigo, all rights reserved worldwide.